As regular readers will know (hello Mum!) I'm rather partial to an upside down cake. Similar to a crumble cake, it saves fumbling and faffing with piping bags and ornate icings. A simple inversion of the cake tin (but do feel free to be as theatrical as you like; a 'ta-dah!' is optional) and you've a ready- decorated beautiful bake. 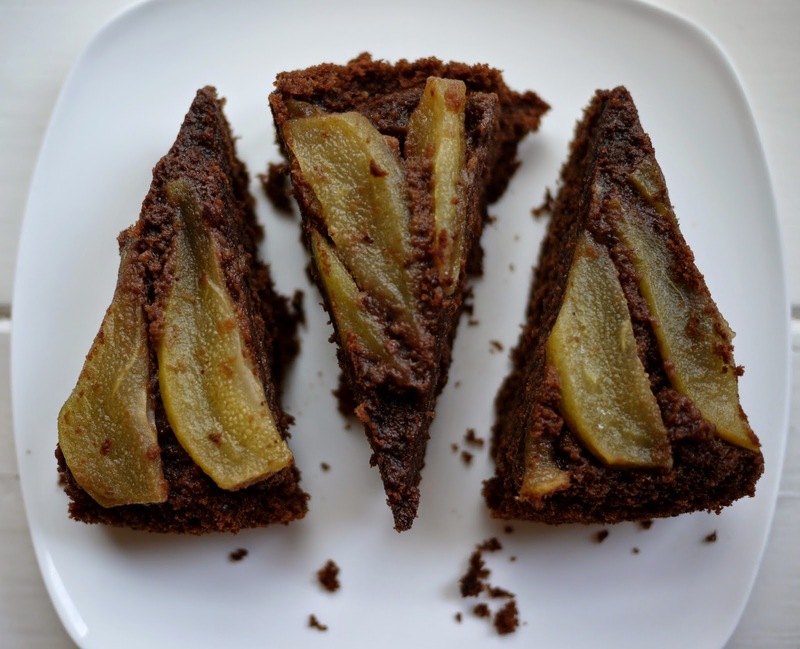 This is a deliciously moist, moreish chocolatey cake with the caramelised pears adding a sweet, fruity twist. Dove's Farm recently sent me a couple of selection boxes of gourmet gluten-free flours to try out. It was as though this baker's Christmas had come early, except with miniature flours rather than chocolate. I'm doing lots of delightful experimenting with the various flours and used the buckwheat flour with great success in this recipe. There are lots more inspiring ideas over at Dove's Farm. 3. To make the cake: cream together the butter and sugar until pale and fluffy. Add the eggs and extract, a little at a time, beating well. 4. In a separate large bowl, sift in the flour, cocoa powder and baking powder and stir in the almonds. 5. Beat in half of the the dry ingredients into the creamed sugar and butter, followed by half of the milk. Repeat until all the ingredients are combined. Spoon over the pears, leveling the top and bake for 45-50 minutes. 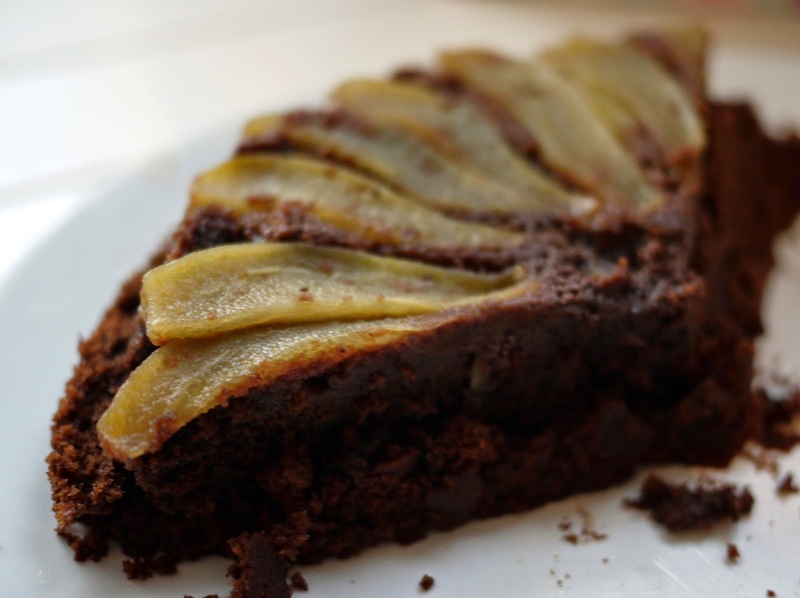 Pear and chocolate - it doesn't get much better than that. Looks amazing...I am leaning away from my keyboard so I don't get drool in it! I love the idea of upside down cakes. To me, they can be quite fancy. And I'm loving this cake already. Caramelized pear and chocolate? The answer is always yes. I was just thinking about making an upside down pear cake last week as pears are everywhere. This looks gorgeous and I like that it's gluten free. The buckwheat flour sounds tasty. A classically great combination of flavours here! It looks really appetising too! Pears and dark chocolate = the perfect combination. This looks absolutely delicious. Mmmm - moist and chocolatey, and topped (bottomed?) with caramelised pears - perfection! Can't believe that I wasted the last of our pear crop on a chutney! !